The COWIN KY5000 Sound Bar is a 2.0 Channel Bluetooth soundbar that brings much better sound to all your favorite TV programs. Experience pure, crystal clear sound with less 0.5% total harmonic distortion and great deep powerful bass. This soundbar is so convient that you can place it almost anywhere. Very attractive designs, the perfect balance between beauty and function. Featuring a shortened body that measures 43 inches in length, this compact 40W speaker installs unobtrusively in bedrooms and small environments. This sound bar features a slim beautiful design that complements your TV, which is so cool to set it under the television or mount it on the wall. 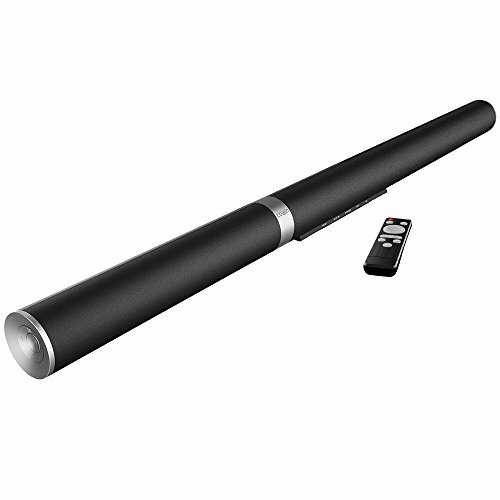 Depending on your TV model and home theater setup, the COWIN KY5000 Sound Bar pairs with Bluetooth from up to 49 ft / 15 m or connects with the 3.5 mm, RCA, and optical, AUX inputs. A more pure, unaltered audio reproduction. You can operate it easily with a fully functional, intuitive remote control. Dual operation modes for convenience offers high grade convenient one button control and a remote. Easily control TV, Bluetooth connections and more. Different colored LED lights display different modes. REMOTE OR BUTTON CONTROL: Dual operation modes for convenience offers high grade convenient one button control and a remote. Easily control TV, Bluetooth connections and more. Different colored LED lights display different modes. We provide 18-month warranty and quick response & friendly customer service.